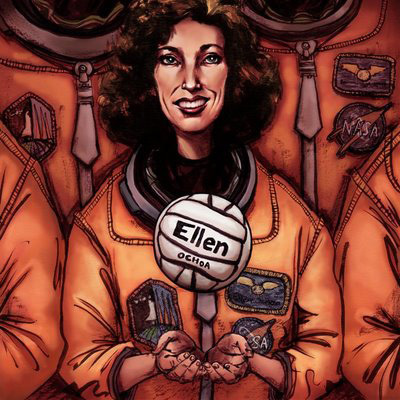 Ellen Ochoa is a hero for many women. She was born on May 10, 1958. She is half Mexican. Ellen Ochoa is a hero because she was the first Hispanic woman astronaut; she was a groundbreaker, and she is admirable. On April 8, 1993, Ellen became the first Hispanic woman to fly into space. 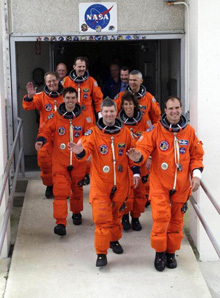 Ellen and four other male astronauts were aboard the space shuttle Discovery. On November 3, 1994, Ellen made a second flight into space on the space shuttle Atlantis. Her special job was to use robotic arms and send them into space to catch a small 2,800-pound satellite called "Spartan." A groundbreaker; that is what Ellen is. It’s interesting to be an astronaut, but to be the first Hispanic woman astronaut is more interesting. Many women say, “Oh, I’m a girl, what’s the use?” Ellen didn’t believe in that. She did what she wanted to do without thinking about what people said or what background she came from. Being the first one to do something is pretty difficult. Astronauts receive a lot of training and Ellen never gave up, even though some people didn’t believe in her. Many people admire Ellen Ochoa. When she couldn’t decide what career she wanted, she asked both her physics and her engineering professors. Her engineering teacher told her that engineering was too hard for a girl. Ellen’s physics teacher told her that physics would get her somewhere. Though her engineering teacher told her she was a girl and couldn’t do engineering, she followed her engineering dreams. Ellen gives good examples of telling people that even a girl can be anything she wants to be. Ellen is still considered a hero, not just because she is the first Hispanic woman astronaut, not because she is a groundbreaker, not because she is admirable, but because she proved that women can do anything that they want to do. Women have the same opportunities that men have. All you have to do is follow your dreams whether you are a female or a male. Carla from Longmont, one our MY HERO guests, wrote above why she believed Ellen Ochoa is considered a hero. All her accomplishments, being a female, are far more than enough acknowledgments for her to be considered a hero. But it was not only her gender that made her the hero she is today, it is also her heritage and her breakthrough achievements and awards. She has made a difference in the world of astronauts and she is a perfect role model for the Hispanic community. Ellen Ochoa was born on May 10, 1958 in Los Angeles, California but grew up in La Mesa, California, which she considers her hometown. She graduated from Grossmont High School in La Mesa, California in 1975 and received a Bachelor of Science degree in physics from San Diego State University in 1980. After graduation from San Diego State University, Ochoa considered a career as either a classical flutist or in business, but the insistence of her mother on the importance of education led her to another path. She continued her education as she went on to Stanford University where she received a Master of Science degree in 1981 and doctorate in electrical engineering in 1985. 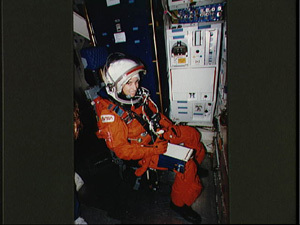 Dr. Ochoa was selected by NASA in January 1990 and she became an astronaut in July 1991, while becoming the world’s first Hispanic female astronaut. She is a mission specialist and flight engineer being a veteran of four space flights, logging more than 950 hours in space. 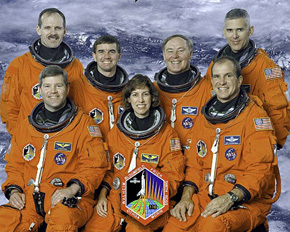 She has been part of space flights such as the STS-56 ATLAS-2 Discovery from April 4-17, 1993, STS-96 Discovery from May 27 to June 6, 1999, and STS-110 Atlantis from April 8-19, 2002. Dr. Ochoa is also part of many organizations and has received numerous honors. She is a Member of the Optical Society of America (OSA), the American Institute of Aeronautics and Astronautics (AIAA), Phi Beta Kappa and Sigma Xi honor societies. NASA awards include the Exceptional Service Medal (1997), Outstanding Leadership Medal (1995), four Space Flight Medals (2002, 1999, 1994, 1993), and two Space Act Tech Brief Awards (1992). Recipient of numerous other awards, including the Women in Aerospace Outstanding Achievement Award, The Hispanic Engineer Albert Baez Award for Outstanding Technical Contribution to Humanity, the Hispanic Heritage Leadership Award, and San Diego State University Alumna of the Year. [Biography Base] She also has two schools named after her: Ellen Ochoa Middle School in Pasco, Washington, and the Ellen Ochoa Learning Center in Cudahy, California. Besides her outstanding career as an astronaut, Dr. Ochoa is also a classical flutist, a wife, and a mother. She now lives in Texas with her husband Coe Fulmer and their two children. She is an outstanding role model for anybody that wants to go above and beyond. She broke through barriers with no hesitation and worked hard for what she wanted in life. Her accomplishments and awards speak for themselves and we are proud that she is representing the Hispanic community in such a great way. Ellen Ochoa went against the odds and succeeded, giving a prime example that anything you want in life is possible, and for that, Ellen Ochoa is my hero!